Mark Morrison has a deep interest in health and well-being. Before joining the Peace Corps he worked as a residential counselor for the Seattle Association for the Jewish Disabled, where he found a role for mental health patients to help other patients and to take greater responsibility for their own well-being. 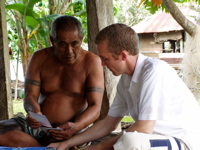 As a Peace Corps volunteer in Samoa he conducted a survey of the special needs population on the island of Savaii, organized construction of a playground and restoration of the Marist Centre for Special Learning, and implemented the first-ever special needs sports and culture days on the island. Commenting on his decision to come to Duquesne's Policy Center, Mark said, "After Peace Corps, I was looking for a graduate program that would allow me to study a broad range of subjects affecting international development and social justice." Mark wanted to work at an international relief organization. When he interviewed at Brother's Brother Foundation they hired him on the spot, and he worked there throughout his two years as a Peace Corps Fellow. His supervisor at Brother's Brother wrote, "Mark's help during the hurricanes in 2005 was outstanding. His extra hands made [our work] lighter, and he helped so many in need in his home area of Louisiana." In the Policy Center Mark concentrated on Policy Analysis and Administration. Building on his interest in health care, his thesis analyzed the role of traditional medicine in modern healthcare policy development in West Africa. 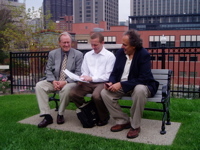 "The Social and Public Policy Center at Duquesne University has provided both a positive social network and a very valuable academic experience," Mark said at the time of his graduation. Brother's Brother offered Mark full-time work as he neared the end of his studies. "For me, it is a perfect fit," said Mark. "I get to live in a wonderful city and remain close to friends and family while continuing to make a positive impact in the lives of many thousands of people around the world who are less fortunate." Mark took over Brother's Brother's humanitarian program two weeks before school ended, closing out the programs from Hurricane Katrina in New Orleans and the South Asian tsumani. He also worked to bring in a major corporate donor—CROCS shoes—especially helpful for coastal regions damaged by floods. 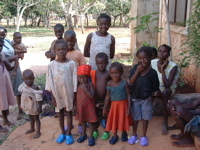 Between May and September 2007 Mark shipped more than 30 containers (10,000 pairs of shoes per container) to over twenty countries, where the shoes are being used as an incentive to attract school-aged children to HIV/AIDS education events. Another initiative involved providing minor surgical instruments to community-based clinics in rural regions throughout Africa. 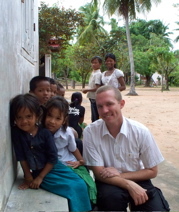 In April 2008 Mark left Brother's Brother and began work as a community-based rehabilitation advisor for the Belgian NGO, Handicap International in Cambodia. Overseeing a team of 12 young Cambodian field staff, he worked to develop self-help social action groups of disabled people in 48 villages in Siem Reap Province. Mark traveled throughout the country to meet with people in need, focusing on social networking, empowerment, and mobilization. As his initial contract was about to expire, Mark accepted a new position with Handicap International as Country Disability Advisor. In this capacity he oversees Handicap International in Cambodia’s four programs: landmine action, prevention, rehabilitation, and social integration/human rights. He also has responsibility for the company’s five-year strategic plan for the country.